Bill Kelley knows a good thing when he sees it. 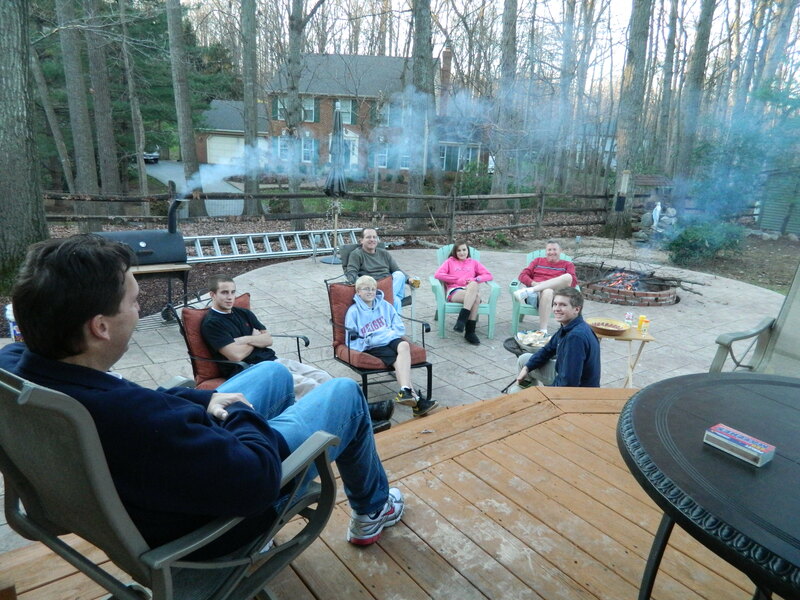 His decision to smoke our Thanksgiving turkey on the outdoor smoker is more than just sustenance, it’s a social event. Everyone gathers around the smoker to smell, add some wood chips, turn the bird, plus ogle and tell Bill what a cool guy he is. Pair that with a fire pit, popped corn over the flame, a TV screen with football, a couple of footballs to toss, and you have a Thanksgiving party! Cooking the turkey outdoors is a social event. It starts with the wood chips. Our yard has nearly 20 varieties of trees and we are always trimming and chopping. Bill used oak wood this time for the smoker. Then, he built his recipe around something called Bonedust Seasoning Rub – a seasoning mix with pungent spices that he incorporated into a brine/marinade. The recipe he found was for smoked turkey legs – first marinating the turkey legs then rubbing Bonedust on them before smoking. Bill took the basic tenets of this recipe and adapted them for an 18-pound turkey. He created the brine by using the marinade with Bonedust recipe from King of the Q’s Blue Plate BBQ cookbook. The Bonedust Seasoning Rub is author Ted Reader’s signature seasoning mix that can be used on everything from ribs to popcorn. A typical brine for any meat would involve soaking it in a solution of water, salt and sometimes sugar before cooking. 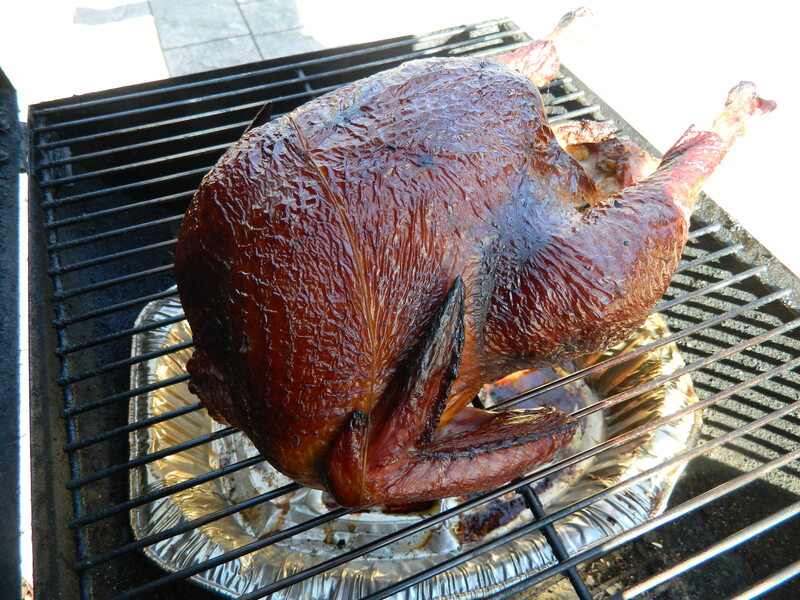 As the turkey soaks it absorbs the brine, retains it during cooking and the result is a juicy and great-tasting bird. Bill improvised a bit from Ted Reader’s turkey leg method and here is what he came up with. Bill doubled the marinade for an 18-pound turkey. Place the turkey in a brining bag, place turkey in bag, seal, and turn occasionally to cut turkey. Marinate for 12-24 hours. The turkey went on the smoker at 8:30 a.m. and by 5 p.m. we were ready to eat. He tended to the wood and the temperature except for a few hours when he played in the annual Turkey Bowl (see He Left Me…Alone with the Turkey). The bird was succulent, juicy and oh so memorable. Pared with Bobby G’s gravy, it was a turkey to remember. Bookmark this page for next year or try it for Christmas. It’s worth it. And, everyone will think you are really cool!